***UPDATE: Part two of this interview can be read here. There’s no question he came to the right place. For as long as there’s been a Big Journalism, Breitbart News has been one of Chuck Todd’s (and the mainstream media’s) toughest critics. Throughout the interview, as you’ll see in part one today and part two tomorrow, Todd returned again and again to the media’s credibility problem with the public (a recent Gallup poll showed that trust in the media is at an historic low). But he was also game for any and all questions. Like his mentor and friend, the late Tim Russert (who brought Todd to NBC in 2007), Todd’s political career began in electoral politics. Before moving into campaign and political reporting, Todd served as a staffer on Democrat Senator Tom Harkin’s ill-fated 1992 presidential bid. From there he moved to National Journal’s Hotline, where he would stay for 15 years, six of them as editor-in-chief. Todd’s stewardship turned The Hotline into more than just a daily must-read for political junkies. This daily briefing helped set the table for the national media’s political coverage. Todd’s influence as a media agenda-setter only grew at NBC News, where he served as Chief White House Correspondent and Political Director, before sliding into one the most coveted seats in his profession. For the interview, there were no preconditions on time or topics in what quickly turned into a spirited but friendly and frank discussion/debate that touched on where Todd intends to take Meet the Press, his plan to win back conservative viewers (who still miss Russert), and the mainstream media’s bias against conservatives (Todd admits it exists). Specifically, I wanted to know when or if the media will ever do the right thing for the country and declare President Obama’s economic policies a failure. BREITBART NEWS NETWORK: First off, we very much appreciate you doing this. You certainly didn’t have to. We’ve been tough critics of yours, and we respect that you’re doing this. 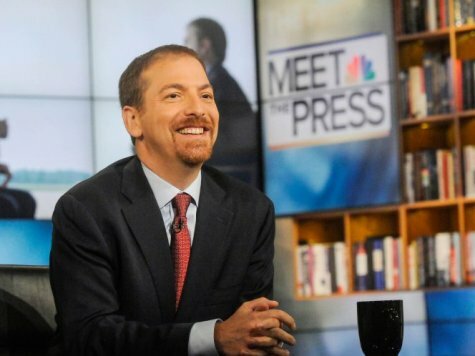 CHUCK TODD: This is a step in the rehabilitation of my business. Talk to the critics. Talk to the skeptics. CT: People want to feel as if we’re not treating either party as a caricature. One of the things I want to do better is to remind people that while both parties are more ideologically homogeneous than they have been in the past, there is still the business conservative and the populist conservative. One Republican does not represent everyone. Meet the Press needs to reflect that there are multiple points of view within the conservative movement. Same with the Democrats. Basically, both parties have an establishment and populist wing. The media in general has been a little too broad-brushed. I simply want to be tough and fair with everyone equally. Over time people will judge. BNN: It’s not at all that we want the media to be softer on conservatives. What we want to see is the media be as tough on Democrats. CT: Tim [Russert] had a great line, a mantra, something he took from [Meet the Press co-creator and 28 year moderator Lawrence E.] Spivek: You learn absolutely everything you can about the person you’re going to interview and take the opposite point of view. That’s how I try to approach it. Some viewers don’t like it. But if you’re trying to find out why somebody believes in a point of view or policy, that’s sometimes the best way . BNN: But when you look at the media as a whole — and I know you’re not The Media — it’s actually kind of jaw-dropping to see Harry Reid and Joe Biden make one bigoted statement after another and get a pat on the head from the media, while our guys get eliminated — whether it’s a George Allen or a Trent Lott. That overall approach has really destroyed our faith in the media. It’s beyond bias now, Chuck, we see the media as a whole as a branch of the Democrat Party out to annihilate us. CT: That’s a mindset I can’t do anything about. There are some practitioners in the media that view things as a campaign. Look, it doesn’t help when any former political operative is involved as a news executive in any form. It’s all winning and losing. BNN: Do those of us on the political right have a point about media bias? CT: I’ve always said yes, but I’ve always believed it’s more cultural than ideological. If you move a news headquarters to Kansas City, you’d have a different set of geographical biases. When you look at one of the big complaints of sports coverage, it’s East Coast bias. That’s because of where the entire sports world is headquartered — within spitting distance of the Red Sox and Yankees –so that’s the most important series no matter what happens. And some people do believe that if you go to church that often it makes you a religious zealot. So that’s what I mean when I say it’s more cultural. But people will pick at an issue and attack us [the media] as though it’s ideological. BNN: Isn’t it six of one, half dozen of the other? Isn’t that cultural bias going to trickle down into issues: gay marriage good, guns evil? CT: It’s become more pronounced as our politics have become more cultural. There was a time when politics was less cultural. It was less a part of our DNA. We’re basically sorting ourselves now: Democrats live with Democrats, Republicans live with Republicans. So we’re aligning ourselves culturally with our politics. BNN: And now the cultural left, which includes much of the media, is completely enamored with government. That’s where I think policy is affected by this cultural bias. For instance, I never hear the media talk about federalism. During the big gun, immigration, and minimum wage debates we’ve recently had, I have never once heard anyone in the media say to a Democrat, “Maybe it’s better for the states do this.” It’s as though that premise doesn’t even exist. And when you get to a point where you have a media that culturally and collectively believes government is good — especially the federal government — that trickles down to policy. CT: That’s a fair critique. Instead of what’s the societal, corporate or community role, the media has an assumption that government should be part of the answer. BNN: But not state government. Sure, it might make sense for South Dakota to raise the minimum wage but not another state. It’s always a one size fits all media debate. CT: I think this time with the minimum wage debate there’s been more nuance than we’ve had before. BNN: I agree there’s been more discussion of whether or not it’s effective financial policy. CT: The government folks would say that all we in the media do is focus on when government does bad. That’s the complaint I get from agencies. BNN: (joking) Do you ask for examples? Because I would ask for examples. CT: It’s the mundane stuff that works. If nothing bad is happening, is that an example of something working properly? No bad beef got through the inspectors, for example. BNN: That’s actually a great example. And I’m not someone who believes there’s no role for the federal government, but as a last resort. This is a good spot to get into Meet the Press. A primary theme you’re pursuing is how DC is out of touch. CT: My big example is the economic recession. DC and New York never went into recession. Virginia basically went through a boom with defense contractors all being located here at a time of war. Residents of those cities don’t know anyone whose mortgage is underwater or couldn’t qualify for a loan from the bank because money was drying up… Things like that make it easier to be out of touch, primarily on the economic front. And this becomes reinforcing against a mainstream media that already has a credibility problem with the public. We really did a poor job covering the recession. BNN: You look at polls and for six years the public’s number one issue has been the economy. But the media’s been all about guns, gays, the NFL, and a local crime in Florida… Those of us old enough to remember the Reagan and Bush years — let’s just say that this just feeds into our distrust of the media. We do look at it as the media covering for Obama. CT: That’s not the motivation at all. But we need to make the extra effort to tell the story of what’s going on in small town and big city America. They’re all going through this horrible economic transition that may end up working. But if you go to any small city or big town, only two areas of the economy are working: healthcare and education. We haven’t told that story. BNN: It’s not too late. CT: I’ve got some things coming up in a couple weeks where I’m trying to show the geographic disparity of the economic recovery. Economists look at the numbers and say, “This is a sign of a healing economy,” but it really depends on where you live. If you live on the coasts, things are going well. If you live near a big city, things are going well. It’s in the middle of the country — it’s not just jobs, but good jobs, and will my kid have a job. BNN: Doesn’t it come down to policy. One thing that needs to be said after four or five years is that President Obama’s economic policies have pretty much failed. BNN: I’m basing it on history. It took Reagan roughly two to three years to get us out. It took Bush  and Clinton maybe two years [referring to the 1992 and 2000 recessions], which were shallower recessions. But what Reagan inherited was just as bad as what Obama inherited. The Reagan policies created a million jobs in one month. Now we’re six years into Obama’s policies. At what point, for the good of the country, do we admit Obama’s policies have failed? CT: It’s always been: “This is going to be the year the economy accelerates,” and every time you think the economy is stepping on the gas, something trips it up. I think we’re going to know in six to nine months. That’s when a judgment will start to be made. CT: Well, let’s see. This had been a fairly good year on the job creation front until we hit August. BNN: If you compare it to past recoveries, it hasn’t really been a good year. BNN: There’s this curve Obama’s graded on. A 300,000 job month is really just okay, barely ahead of population growth. And I’m not trying to be partisan. The Clinton economy was great. But there just seems to be no media sympathy for the people who are struggling through this. I look at my wife, who has plenty of skills, but who was forced to retire early because we were at a point where we needed income and she couldn’t find a job. CT: My mom had to make the same decision. This economy has been especially brutal to people over 50. I remember early on [in the recession] we did stories on how hard it is to find a second and third career in your fifties. All the juice seems to be catering to the Millennials. It’s all about them. BNN: And they’re struggling as bad as anyone. BNN: If we’re going to help these people, it’s going to have to start with an admission [in the media] that Obama’s policies just aren’t working. That would be showing compassion to everyday people who are dying out here. But I’m not sure the media has it in them to admit that. I hope I’m wrong, because that’s the first step in solving the problem. CT: One thing I think we can agree on is that we in the media have not covered this economy and economic recovery very well. If I have a small goal, it’s to do that better. I now have a platform where I can spend real time on a story. Tomorrow, in part two, Breitbart News asks the moderator of “Meet the Press” about Fareed Zakaria’s latest plagiarism scandal, what it would take to get him personally interested in the IRS scandal, and what the difference is between what MSNBC and the Koch brothers do when it comes to using corporate money to push a political agenda.